There are two main reasons for the difficulty in identifying plants, one intrinsic to plants themselves and one more human-centric, and this post is about how botanists have made the impediments a little less impeding. The relevance to Germany is that nowadays it has some outstanding information design in the area of plant identification, although in prior decades the U.S., U.K. and Australia also had fascinating innovations that are now nearly forgotten. The first problem is that, generally speaking, plants must be in bloom in order to be identified, for botanical reasons we won’t go into here, and this includes all grass species and trees including conifers (evergreens), all of which have flowers even though the casual observer may not be aware of them. This drastically restricts the timing of when it’s possible to identify plants. Flowers that only grow high up on trees present further problems. The second challenge is that one must either learn the species gradually over a long time – years – from knowledgeable mentors or else us an identification handbook, and this is where we lose a lot of potential nature-lovers. 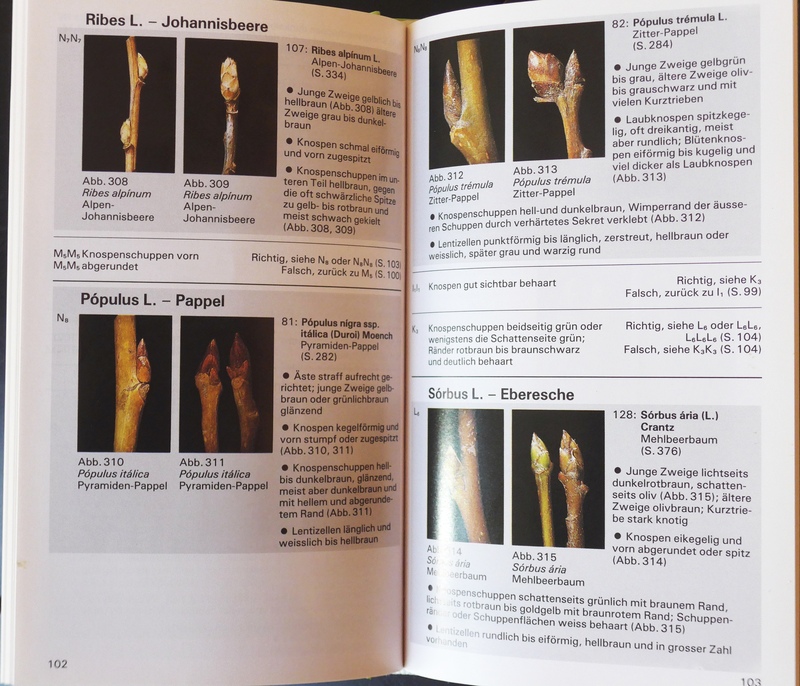 Whereas identifying birds with a book is seldom an overwhelming challenge for anyone with patience and attention to detail, plant identification beyond the few dozen most common species can be daunting to say the least. Until one has memorized hundreds or thousands of small details it requires working your way through a long flow chart of either-or questions about the plant, a sort of questionnaire known as a binary decision tree or in botany jargon, dichotomous key. 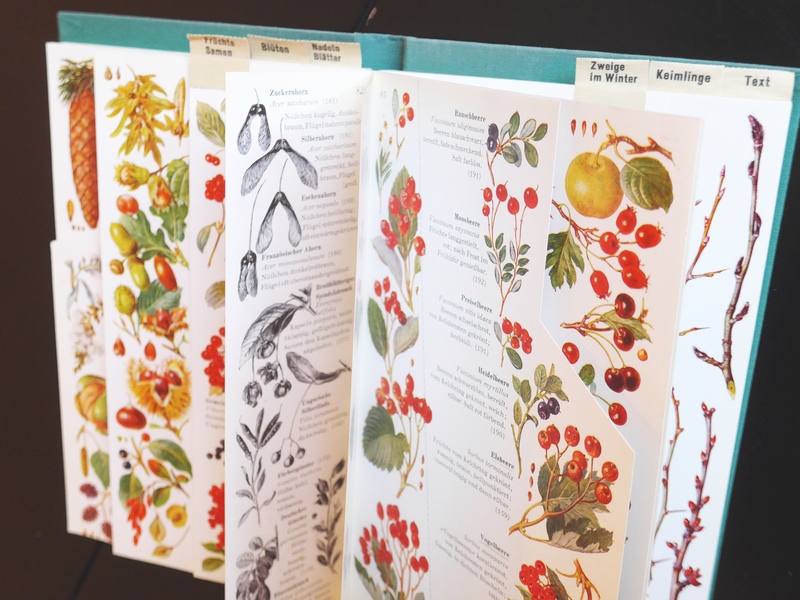 In plant guides, keys can go on for dozens of pages with scores of questions involving scores of obscure technical botanical terms from acaulescent to zonate. It can take anywhere from 5 minutes to an hour and often requires a special powerful magnifying glass, occasionally a microscope, but it’s the only sure way to identify plants correctly. However, both of these hurdles can be circumvented with two handy shortcuts known as vegetative keys and multi-access keys. Vegetative keys allow the identification of plants when they are not blooming, using long-lived plant parts such as leaves or evergreen cones (but seldom tree bark, which the lay public is always surprised to learn is of little help in identifying trees). Multi-access keys are significantly easier to use than dichotomous because they allow you to use whichever traits you happen to observe, in any order, instead of following a strict predetermined sequence of questions. In practice, most vegetative keys are multi-access and vice versa. Overall they make the identification process more engaging to the lay person and more connected to what people see around them in real life, rather than focusing on minutiae that are scientifically necessary but to most people boring. 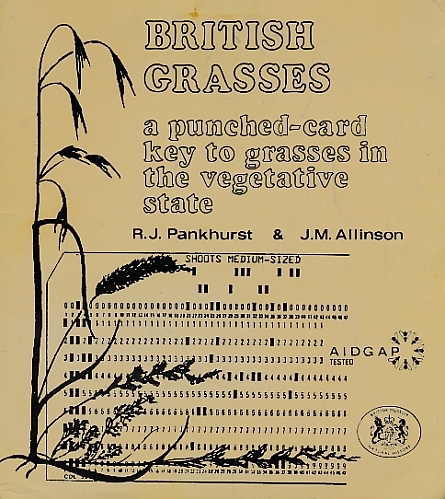 The catch is that any one vegetative key can only cover severely limited geographic areas and kinds of plants (again due to botanical complications). In turn, this means that not many vegetative keys exist because in most cases they would be simply too restricted in scope to be of much use, and there’s no way around that. 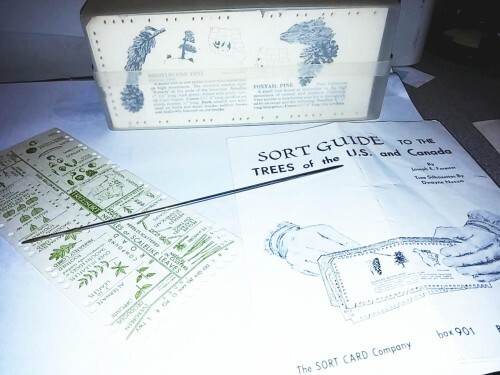 One ingenious and delightful multi-access key is the Tree-Sort, first published in 1961, a set of cards with holes and V-shaped notches along the perimeter, for the most common trees of the U.S. and Canada. 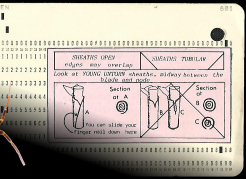 They are the same size as the old punch cards for early computers but are not for computers at all. Each card is for one species, or occasionally two similar species, and has descriptive text and images on the back. 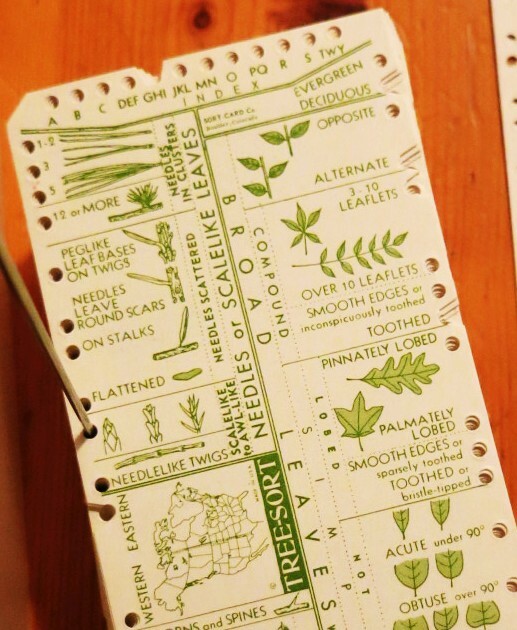 Each hole or notch corresponds to one of the multiple choices for traits described with text and drawings on the front such as “leaves with smooth edges, toothed or scalloped?” (three choices) or “Conifer needles in bunches of 1, 3, 5, or 12 or more?” (four choices). Every card has the same front except that at each trait, the options that correctly describe the species have notches and the non-matching options have holes. You stack up the cards – the order is completely irrelevant – and put a skewer like a thin knitting needle through the hole for any trait you observe on the tree, gently shake the stack, and all the species cards that match your choice fall out because they will have a V-notch rather than a hole. You remove the skewer, set aside the cards that were on it – they’ve been ruled out – stack up the cards that fell out, which are the remaining candidates, and repeat using these . It all goes very quickly because the pile gets narrowed down to a handful of cards after just a couple of questions. Tree-Sort is no longer available but a version for rocks called Mineral-Sort still is. 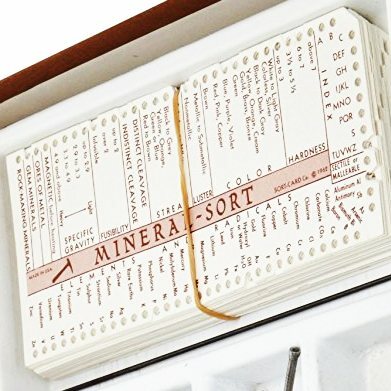 Britain and Australia had similar sorting cards but going in the opposite direction. Their cards each represent one trait and each hole represents one species, which is the reverse of Tree-Sort, and it doesn’t involve a skewer. Unlike Tree-Sort which is for the casual user and includes only common species, these keys are suitable for specialized botanical purposes and focus on smaller areas and groups of plants. You browse through the cards and pick out those that match traits on your plant, for example for leaf edges there might be one card for smooth edges, one for toothed edges and one for scalloped edges, and you remove the right card and set it aside. When you have several trait-matched cards, you stack them – the order makes no difference – and hold them up to the light and then whichever of the 799 numbered holes has light shining through it indicates your species, found on a separate numbered list. If there is more than one ‘illuminated’ hole, your traits match more than one species. The first such cards were made in the 1930s; it has been reported that during World War II, over 60,000 cards for timber identification were prepared for use in New Guinea and the islands to the north. 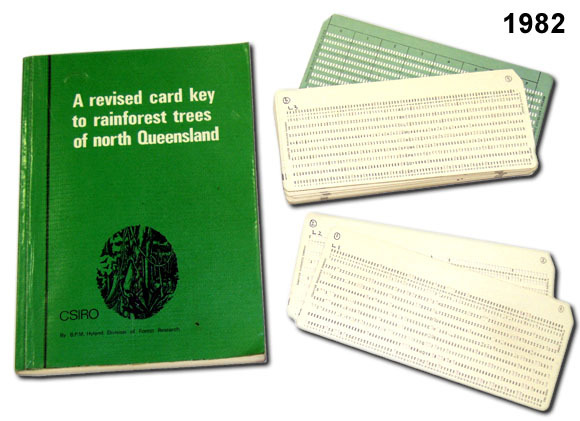 In the 1950s, the Australian Forestry and Timber Bureau produced this card key – in the Tree-Sort mode, one card per species with questions around the perimeter – for Eucalyptus and its relatives, of which Australia has 900 varieties. A few botanists have made plant identification easier by means of visual enhancements to the traditional dichotomous keys rather than avoiding them altogether. Anecdotally there seems to be more of these visual keys in Germany than the U.S. although I can’t claim to have made exhaustive national inventories. This condensed key to conifers combines the questions and illustrations on one page and in doing so accelerates the learning process immeasurably. Dozens of comparisons can be made on a single page that would take painstaking scrutiny back and forth through many pages in ordinary guides. It only covers a limited number of the most common species. This 1978 guide, revised 1983, is conceptually similar but more thorough. 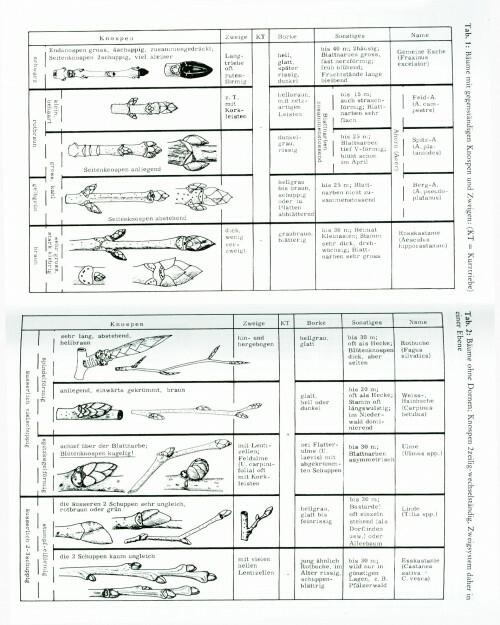 The keys take the form of illustrated tables which are spread across several pages but still allow much clearer, faster and more vivid comparisons than standard text-only keys. 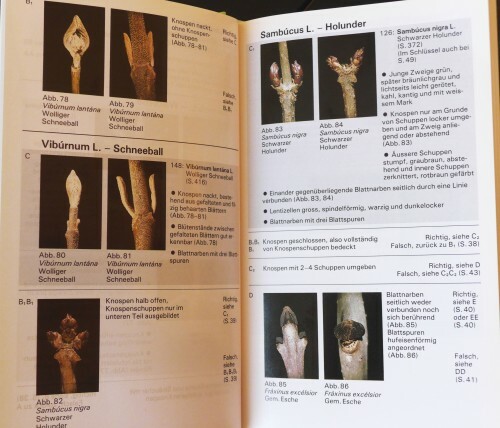 This outstanding key to bud and twig identification – a brutally tedious but unavoidable task in wintertime – has a masterful, rarely-encountered integration of image and text and an ingenious multiple-choice question system. 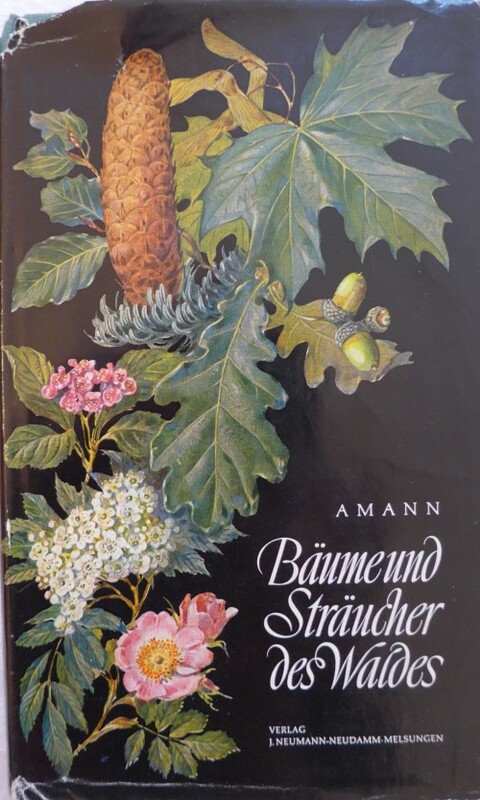 It would be remiss to neglect a treasure of book design from Germany that is visually exquisite and a paragon of information design, although it is mainly for casual nature fans since it doesn’t include many species. This is a guide from 1965 with an absolutely unique arrangement of differently-sized and -shaped pages strategically laid out to enable comparisons at a single glance among easily confused leaves, flowers, fruits, and buds. Tabs made of stiffened cloth along the top allow for instant access to chapters. 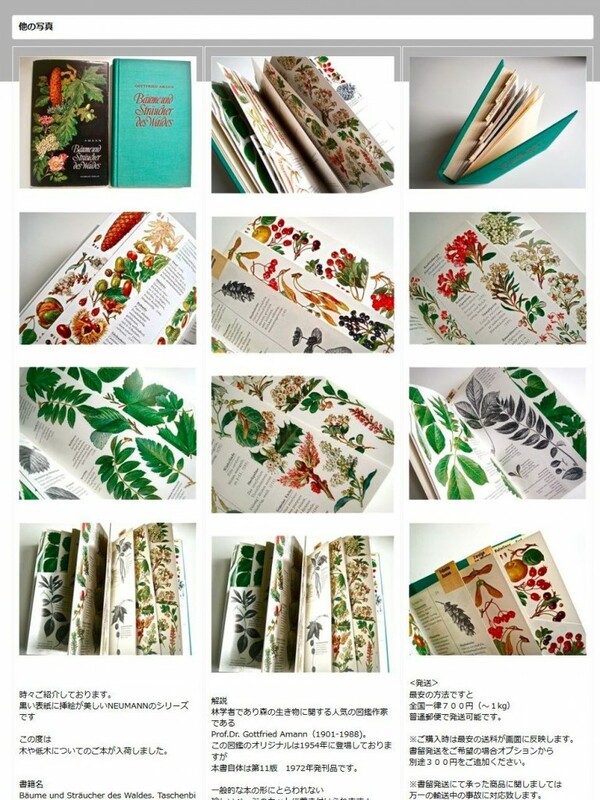 It is no accident that a website in Japan, the unchallenged source of the world’s best information design and attention to detail, painstakingly documents the book. 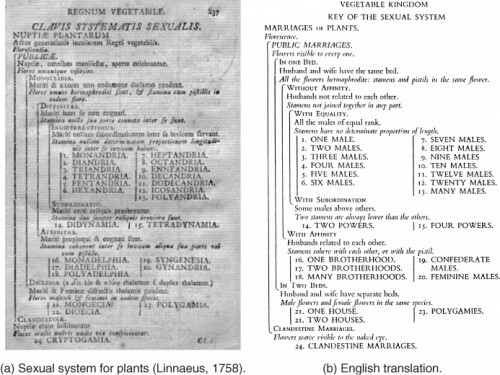 Finally, to digress, a humorous but scientifically valid and in fact world-changing dichotomous key from the 18th century, from the inventor of plant and animal naming and classification as we know it, the Swede Carl Linnaeus (a.k.a. Carolus Linnæus or Carl von Linné). He was first to recognize that it makes sense from biological, evolutionary, and practical standpoints to classify plants based on their reproductive floral parts such as pistils (female parts, become the fruit and seed) and stamens (male parts, make the pollen). 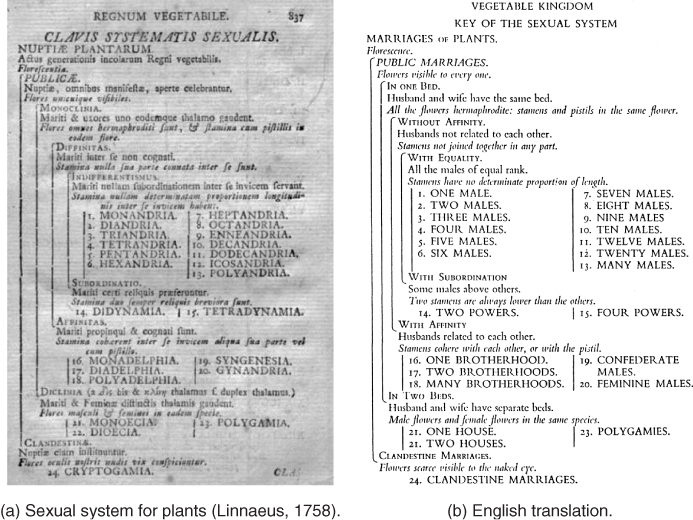 Because these parts take on a multitude of different configurations in different species, Linnaeus classified them in his groundbreaking Systema Naturae (c. 1740) using analogies to women (pistils etc.) and men (stamens) in marriages: often polygamous; spouses living in one house or separate houses, using one bed or multiple beds, sisters married to one man or brothers married to one woman and so forth. 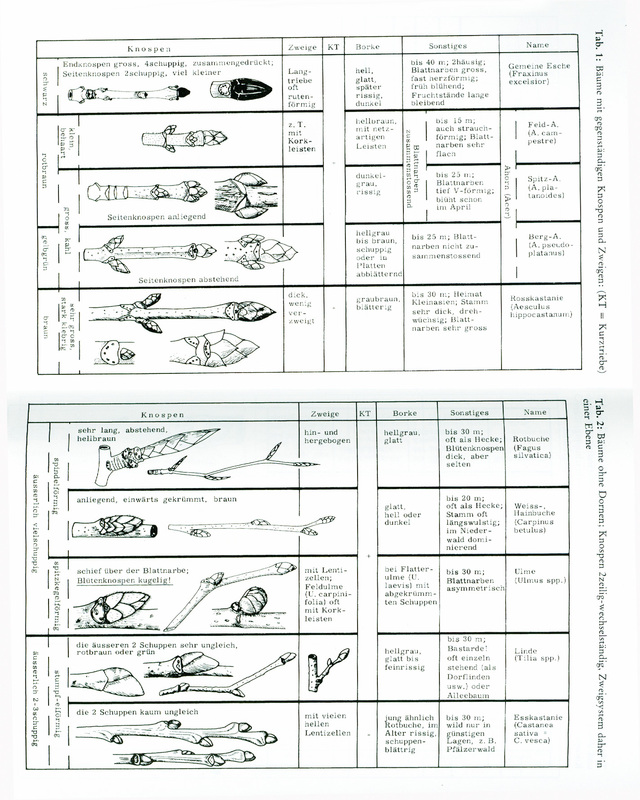 All of these are perfectly valid and accurate analogies to the actual morphology of floral reproductive parts; even the far-fetched ones such as a woman married to nine men and all sharing the same bed. Today, the colorful analogies are no longer used but the underlying system still is, apart from adjustments due to scientific advancements, and Linnaeus’ morphological observations are largely correct. 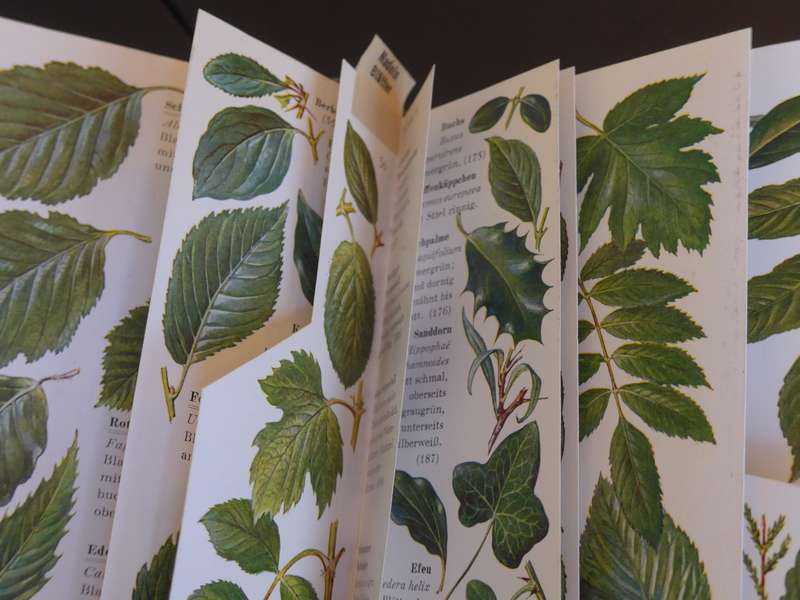 Thanks go to the Berlin-Brandenburg Botanical Society at one of whose botany walks I discovered some of the German resources. Hall, Norman. The Field Identification of Eucalypts. Unasylva. Vol. 7, No. 2, June 1953. Krüger, Marcus. 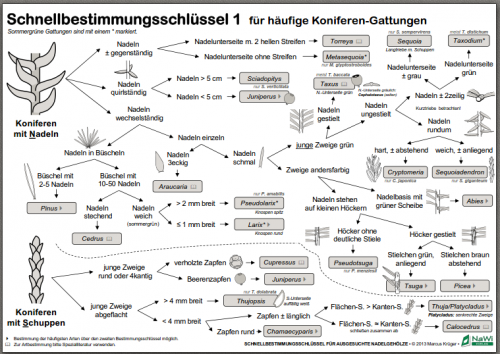 Schnellbestimmungsschlussel fur ausgesuchte Nadelgehölze [Quick Key to Selected Conifers]. NaWi Verlag, 2013. 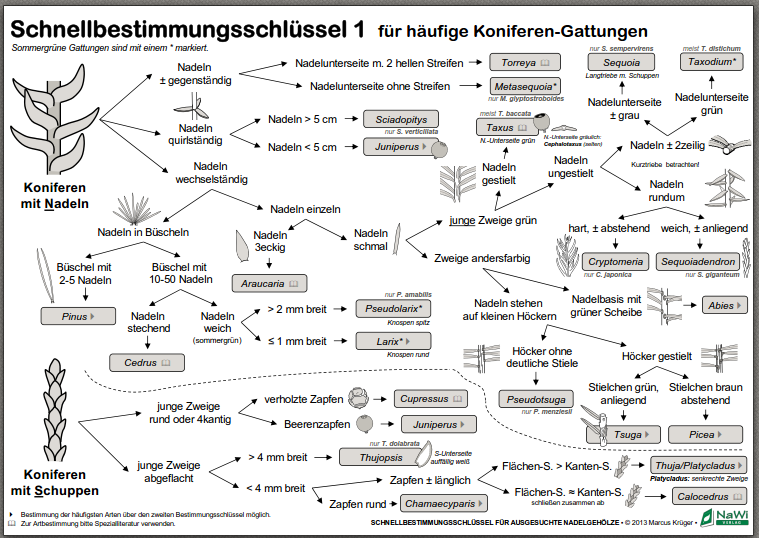 Free download at www.nawi-verlag.de Also available at the same site, in German: Quick Keys to Selected Plant Families; Selected Deciduous Trees and Shrubs in Winter; Selected Arthropods. Haller, Berthold and Probst, Wilfried. Botanische Exkursionen Band 1. Winterhalbjahr [Botanical Excursions Volume 1. Winter]. Springer, 1983. Godet, Jean-Denis. Knospen und Zweige. Einheimische Bäume und Sträucher [Buds and Twigs. Native Trees and Shrubs]. 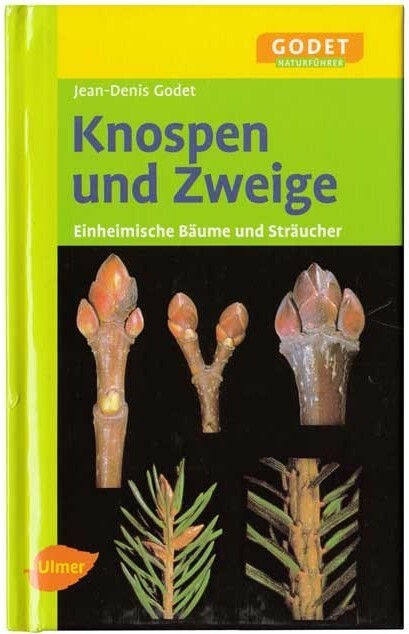 Naturbuch Verlag, 1998. Since reprinted by various publishers. Amann, Gottfried. Bäume und Sträucher des Waldes [Forest Trees and Shrubs]. Verlag J. Neumann, 1965.